So I've sort of realized something. I'd much rather watch a television series months (years even) after it was originally on t.v. Also known as "Hi, my name is Christina, and I'm an instant gratification-aholic." What? Let me explain- because then I don't have to wait a week to see what happens next! Since not having cable and having to rely purely on services such as Hulu and Netflix for our television wants and needs- I've grown quite fond of things like commercial-less viewing and immediate fast forwarding to the next weeks show! I mean, sometimes they leave you with the worst cliff hanger and I couldn't imagine having to wait a whole week (7 grueling days!) to see what happens next. I mean, sure- shows like Parks and Recreation and 30 Rock (two personal favs) don't really fall into that category, but those pesky dramas that you just can't help but get sucked into (every time) surely do! Confession time: I'm a HUGE lover of older "dramatic" television shows. We're talking, ahem... Dawson's Creek, Felicity, Arrested Development (not dramatic, but it's older! ), Firefly, and currently...Alias. Alias. That's my show. I love it almost as much as Felicity....almost. Sydney and Jack, and Will...and Francie and Vaughn! That JJ Abrams SURE knows how to create a television series! Uhhh and he REALLY knows how to make a cliff hanger! He did it to me with Felicity and he's doin it again with Alias!! GAAAAW! Side note: I never cried as hard during a tv show in my life, like I did with Felicity. Anyways, I mean my husband and I will be all snuggly in bed calmly watching an episode (which we will have previously said to one another, "Just one show tonight, k?") and 5 shows later we're sitting up, eyes wide, still hooked! I mean sheesh! Sometimes I really think about the poor people who watched this show back in '01-'06! You had to wait 7 long days to see what happens next! Not to mention- to see the whole show you had to invest 5 years! Not us...yeah we're like 1083586 years behind, but it's SO much more gratifying watching a show in 44 minutes, without a single commercial, and with the freedom to sneak to the next episode should a cliff hanger make us feel like doing so! You know those awkward moments when after putting a certain thought down on paper/text you look back at it and see yourself for who you really are? Happening right now. I honestly never thought I was such a television watcher! Moving on. I was actually able to pry myself from the Alias world and spend a day with a dear friend of mine for her birthday, last week. Yay me! So, I decided to quadruple duty here and spend some time with her, bake with her (something super simple- something she could make again), teach her baking can be fun and easy, and lastly- make something that she could take home as part of a present! I headed on over to Pinterest and saw what I was looking for- these easy, EASY peanut butter cup cookies by In Katrina's Kitchen. Win! She used a cookie mix to which she added eggs and other ingredients, but I chose to really make it an easy dessert and just go with an already made dough. You know, the stuff you buy in the refrigerated section of your supermarket? Yea that stuff. I don't use it often, but figured for those who don't enjoy baking as much as I do- or are intimidated by baking- this is something very, very simple (and fun). 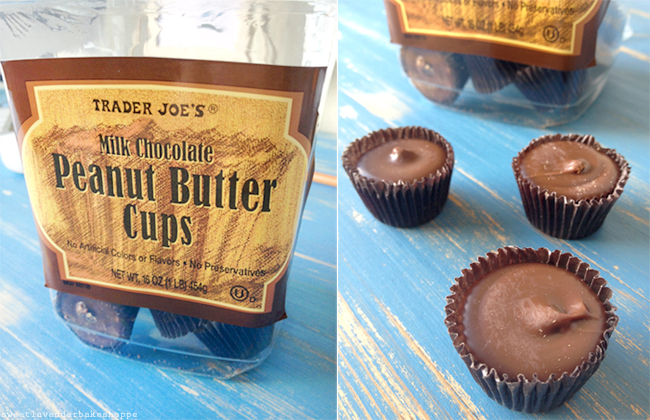 Then, I headed to Trader Joe's and bought one of my favorite mini peanut butter cups- their milk chocolate version. Feel free to pick up their dark chocolate version if that's what you want! Or you could always use the Reese's brand peanut butter cups too- I'm not the biggest fan of those- which is why I picked up the more expensive Trader Joe's kind. 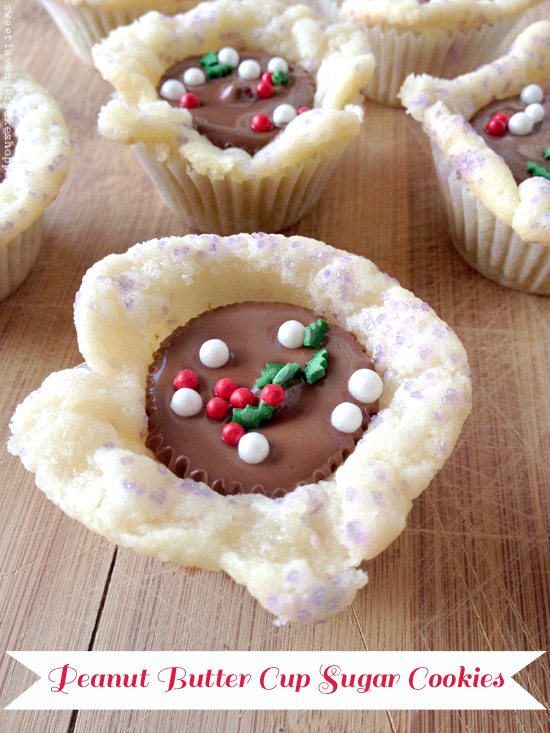 So yes- this recipe is indeed actually 2 ingredients: dough and peanut butter cups. The end. Being my friend's birthday, I whipped out all the sprinkles/sanding sugar/dragees I had and we went a little wild. You do not need to have these on hand- but they do make it even more fun. Sprinkles not your thing- you can also drizzle with melted white or dark chocolate, or top with crushed up candy pieces! 1, 16.5oz roll (log? tube?) sugar cookie dough (I used Pillsbury)- you know, the pre-made stuff! 1. Preheat your oven to 350*F and line 2 mini muffin tins with mini cupcake liners of your choice. You'll want 24 liners used total. 2. 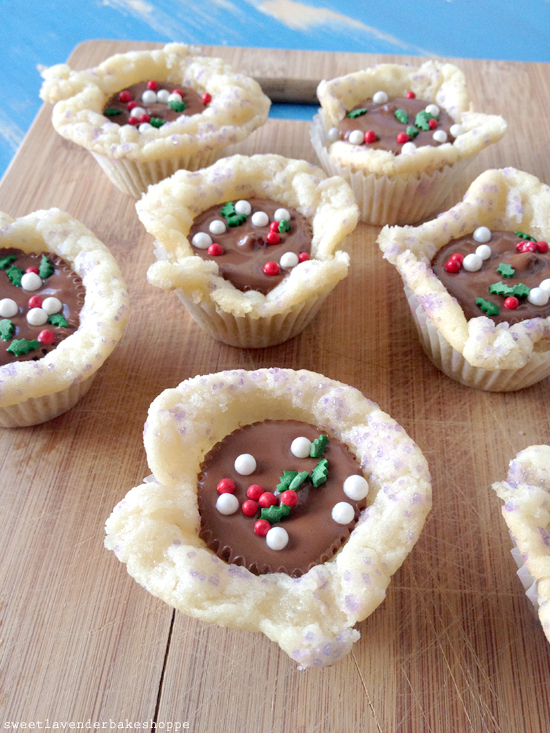 Using a 1.5" ice cream scoop, scoop out 24 balls of sugar cookie dough and place into each cupcake liner. Once all balls are scooped out, gently press down flat into your liners with your fingers. We decided to add purple sanding sugar to our dough at this time- the birthday girl loves purple. Place muffin tins into fridge to chill- 10 minutes. 3. Once chilled a bit, place mini muffin tins into your preheated oven and bake 12-15 minutes. You want your cookies to be golden brown around edges, puffed up, and slightly soft in the center. 4. 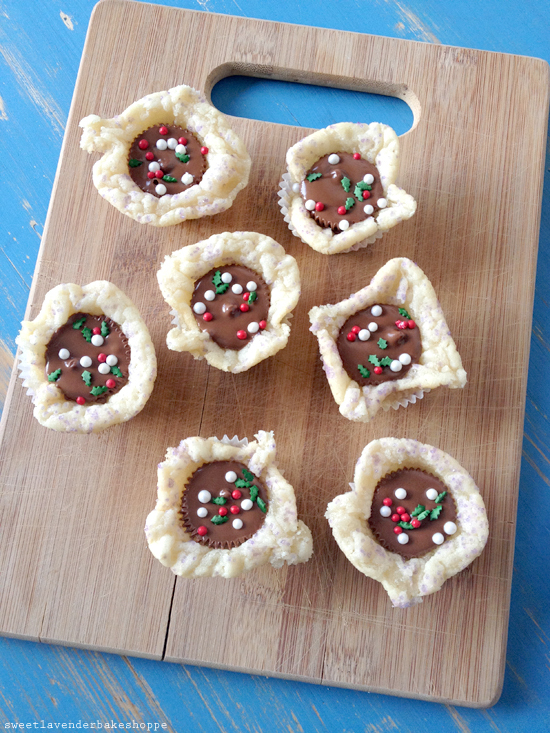 While cookies are baking, unwrap 24 small peanut butter cups and set aside. 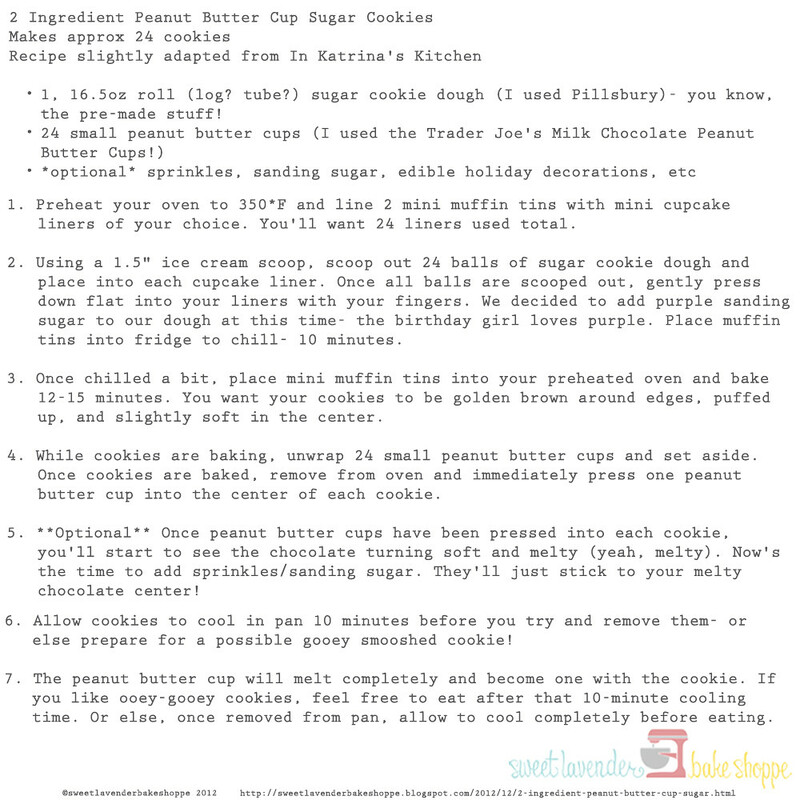 Once cookies are baked, remove from oven and immediately press one peanut butter cup into the center of each cookie. 5. **Optional** Once peanut butter cups have been pressed into each cookie, you'll start to see the chocolate turning soft and melty (yeah, melty). Now's the time to add Christmas sprinkles. They'll just stick to your melty chocolate center! 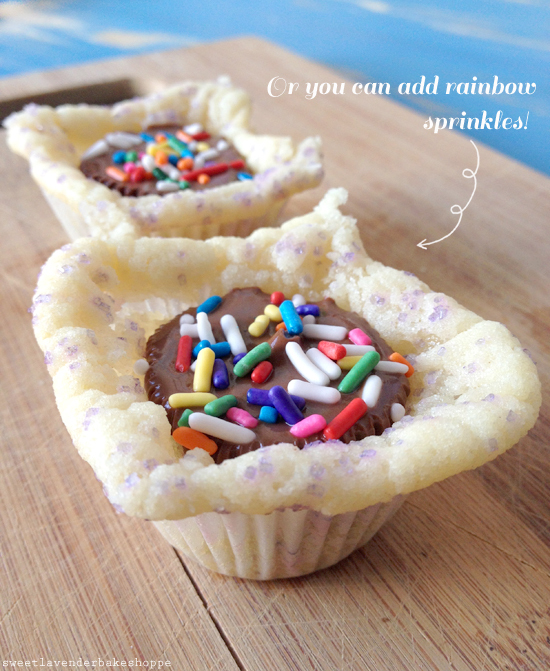 ...or you can add rainbow sprinkles if you're making these for a fun birthday or party! 6. Allow cookies to cool in pan 10 minutes before you try and remove them- or else prepare for a possible gooey smooshed cookie! 7. The peanut butter cup will melt completely and become one with the cookie. If you like ooey-gooey cookies, feel free to eat after that 10-minute cooling time. Or else, once removed from pan, allow to cool completely before eating. I OBVIOUSLY have no self control- so I ate (along with my friend) my cookies as soon as I possibly could. 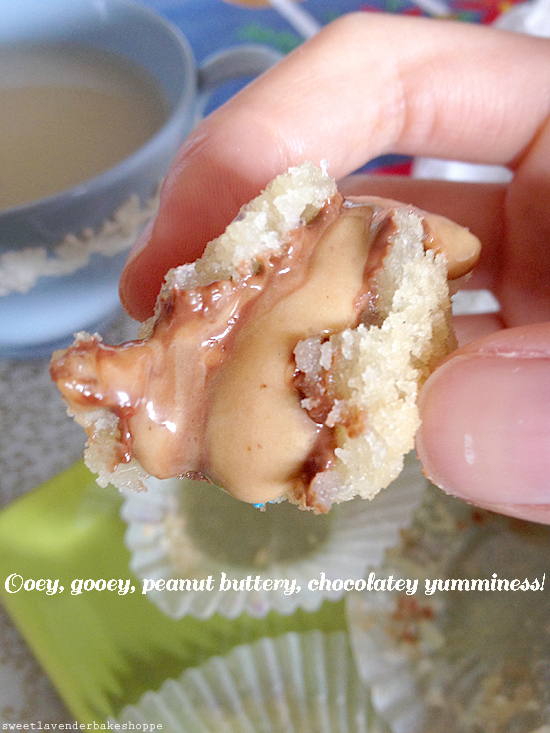 It was ooey-gooey-peanut buttery-chocolatey-madness all over my hands and face...and I loved every bit of it. Please don't judge the fact that yes, I ate 3...in like 5 minutes...maybe 5 minutes. Welp, friends- I just want to take a little second to say THANK YOU. I am so thankful for this glorious year together with you. I am thankful for all of your comments/repins/constructive criticisms/support. I loved it all. I will be breaking from blogging for the holiday week (with the exception of one more fun blog I hope to have up) and will be back bright eyed and bushy tailed after the New Year :) I truly wish you all a VERY Merry Christmas and hope your New Year is the best one yet! How did I miss this post from last year... oh yeah, I just had a baby! ha ha! I'm bummed I missed this one then, because it talks about my favorite things like Felicity and Dawson's and Peanut Butter Cups in Sugar Cookies!! WOAH!!! This would've totally brightened my day too, since i think we were moving Deacon to his second NICU on this day. Man oh man am I glad that drama is over! Oh my goodness, Sabrina! That's the saddest thing. Your poor little one. :( SO glad that this year will be heaps and heaps different! I know it already is, having heard about your Thanksgiving :) Eeeeep, you''re going to love these! One word of caution- let them cool completely before trying to do anything. Or you'll have a nice oooooey gooey peanut buttery mess. (tasty...but messy). :) Let me know how you like em!